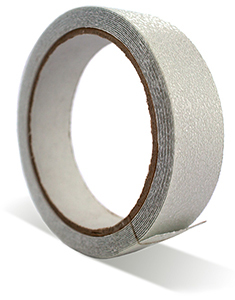 Adaptable and durable bath anti-slip tape, great for shower trays & wet rooms. For those of us who are less mobile, the idea of slipping or falling is a real and ever-present worry. Particularly in places like the bathroom or on stairs which can be slippery or uneven. It can be difficult to find just the right kind of anti-slip protection for your needs; steps might be too big or small and there may not be room to install handles. Welly’s Anti-Slip Bathtub Tape is the versatile solution that can go anywhere you need it. It’s the perfect anti-slip tape for showers and other small spaces. The 3.7 metre roll can be cut to any length or shape you need it; even in awkward corners. The white colour of the tape is visible but discreet and will blend into any décor scheme. To use, clean and dry the surface. Cut the tape to your desired length with scissors. Remove the back covering from the tape and press firmly. The non-slip shower tape will stay where you need it to, but can be removed using a household cleaner if needed.